Ready for some of the most amazing archery trick shots you’ve ever seen? The guys at Dude Perfect are at it again, and they certainly don’t disappoint. When it comes to family-friendly entertainment, it’s tough to top the guys at Dude Perfect. In fact, I learned about their latest archery trick shots video from my 13-year-old son, who subscribes to them on YouTube. As you’ll see below, Bass Pro Shops (which now owns Cabela’s) sponsored this trick shot exhibition. I have no idea how many arrows the guys shot in producing this 7-minute video, but it had to be a bunch. I especially like how they use compounds and recurves. I, too, enjoy shooting both types, and all I can say is I’d never be able to accomplish some (most?) of these trick shots no matter how many arrows Bass Pro Shops shipped to my front door. Example: The Swinging Washer Shot; I could try that a thousand times and never thread an arrow through the swinging washer at 30 yards. Watch and enjoy. Spoiler alert: At the 6:25 mark of the video they attempt the World's Longest Bow & Arrow Shot; distance is 465 yards. Count how many seconds the arrow is flying. Amazing. P.S. 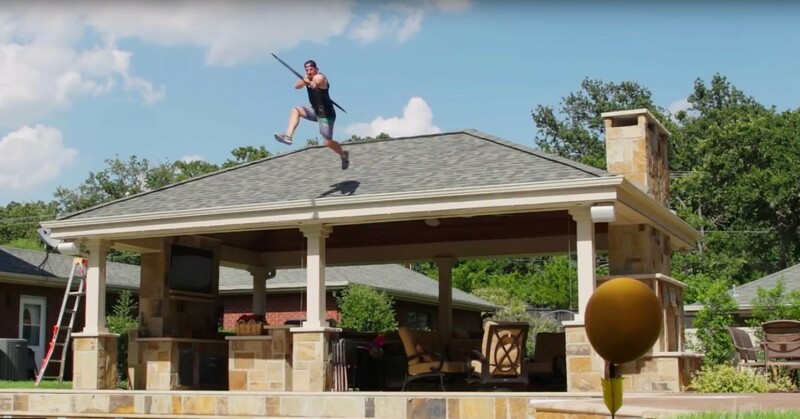 Want to see YouTube sensations Dude Perfect perform crazy-cool trick shots with crossbows? Click here to check it out.